So what’s with the gargoyle anyway? I bet you’re wondering why I’ve adopted that gargoyle as my new avatar, and why this website is now described as my ‘online hiding place’. You aren’t? Well I’m telling you anyway, so there. For one thing, after six months or so of blogging, I decided the site would benefit a bit of a makeover. Meanwhile it dawned on me that calling it CHRISTOPHER-PETER.COM in shouty capital letters made it sound a bit in-your-face corporate, which it isn’t. As for the demented-space-invader avatar, taken from the cover of BASIC Boy – well I still like that, but I fancied a change. Then there’s the fact that I’m one of the majority of writers who sell very little. I once read that something like 95% of self-published authors sell fewer than 100 copies of each title, mostly to family and friends. (I’ve almost certainly got that stat slightly wrong but then, as we all know, 92.4% of statistics are made up on the spot.) It’s just so hard to get your writing noticed when there’s so much of it about. The situation isn’t helped by the fact that, like many writers, I’m not too great at marketing. Jumping up and down shouting ‘Look at me! Look at me!’ isn’t a core strength. So I thought, well, why not embrace my inner introvert? 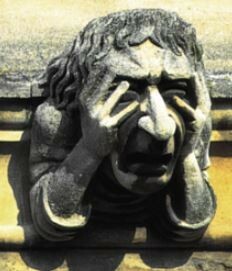 I live just outside Oxford, and that spired city is full of those little stone beasties, gargoyles; and when I found a picture of one who looked like he was hiding, I knew I’d found my new image. At least until I get bored with that one too. So there you go. Now you know, whether you wanted to or not. This entry was posted in Uncategorized and tagged avatar, gargoyle. Bookmark the permalink. ← Does being a writer affect your enjoyment of reading? The good news is that 5% of self-published writers actually do sell more than 100 copies of their work! 1 out of 20, those are steep odds, but much better than say, the lotto or professional football. Thanks for this amusing post. I actually was wondering about the gargoyle! And I can definitely relate to the impulse towards introversion. One of the side-effects of being a writer that I appreciate is all the time alone. That’s a more positive way of looking at it, thanks!